(6:22 PM EDT): The entire Hungarian Socialist Party (MSZP) leadership tenders its resignation. Ákos Hadházy of LMP also tenders his resignation. (6:19 PM EDT): Gábor Vona conceded defeat and will tender his resignation on Monday to JOBBIK presidium. Péter Juhász of the Együtt leadership accepts personal and communal responsibility for the poor result (Együtt is under 1% support on the party list). Mr. Juhász announced that the party will announce Együtt’s future in the coming days. Együtt is now likely to disband. We must be humble after this victory. Hungarian voters have decided to hand Prime Minister Viktor Orbán a two-thirds super majority on 8 April, amidst historically high turnout in this election. Both the left-wing opposition and JOBBIK are decimated. The anti-migrant fear campaign was highly successful in small-town Hungary and successive corruption scandals have not dented Mr. Orbán’s popularity at all. Finally, the National Election Office has published preliminary results (with 69% of votes processed). We can now confirm that Fidesz has won the elections and will have a commanding majority in parliament. Zsolt Semjén, Hungary’s Deputy Prime Minister, has thanked Hungarians, both within Hungary and abroad, for their “prayers” and votes. No official preliminary results yet. The electoral system is brutally unjust, but the opposition has shown a “dramatic” inability to cooperate and coordinate–said Mr. Gulyás over the telephone with Klubrádió. That said, opposition voters should primarily hold Fidesz and its regime responsible. Zoltán Kész, an Independent candidate supported by the opposition, knows that he has been defeated, even though the National Election Office has not released a single official or preliminary result. Mr. Kész has admitted defeat and expressed hope that the winning Fidesz candidate will represent the riding and all of its voters. Zoltán Lakner, speaking on Klubrádió in Budapest, noted that opposition parties had years to prepare for this election and if they chose to contest it, knowing the system’s particularities, they should have recognized that the only way to defeat Fidesz is to field a single candidate against the government in each riding. Yet they failed to do this and in fact, instead, various political formations began to splinter. As such, Hungarian voters must now hold the opposition accountable. Mr. Lakner notes that the narrative has not changed since 2014. As well, promises of civil disobedience did not materialize. New players have shown up on the scene, yet over the past four years have failed to build their brands. Overall, the Hungarian opposition did not adapt successfully to the electoral regime crafted by Fidesz. The opposition parties spent too much time competing against each other and being satisfied with the silver or bronze medal. Unconfirmed reports are spreading that Fidesz has won a clear, convincing majority. About two hundred young Hungarians are gathering in Kossuth Square outside parliament. The crowd heard Péter Márki-Zay, the newly minted anti-Fidesz mayor of Hódmezővásárhely confirm over telephone that Fidesz politician János Lázár, embroiled in corruption scandals, has won in the town of Hódmezővásárhely. The mayor is holding the opposition parties responsible and the crowd in Kossuth Square agrees. When he said that the Hungarian opposition must now be defeated and removed, the two hundred or so young Hungarian opposition supporters clapped in agreement. In the town of Szeged, the Socialists have won one riding, while Fidesz has won the other. The opposition is likely to take the majority of Budapest electoral districts–opposition candidates are leading in most places in the capital. (3:16 PM EDT) A somewhat personal reflection–Why do I engage with Hungarian politics as a Canadian? While we await election results, I took about an hour writing a reflection for my Hungarian-language news site about why I spend such an inordinate amount of time with Hungarian politics and Hungarian online journalism. After all, I was born in Canada, I speak English fluently and without an accent, thanks to my name I can go “incognito” as far as my ethnic heritage goes, and I spend 90% of my days speaking in English only–at work and with friends, and in the broader community too. So why on earth am I so engaged with Hungary? If you read Hungarian and are looking for something to do while we await results, here’s my reflection on the matter. Polls closed two hours ago, yet 2,500 Hungarians are queuing outside the Bocskai Street polling station in Budapest to cast their ballots. 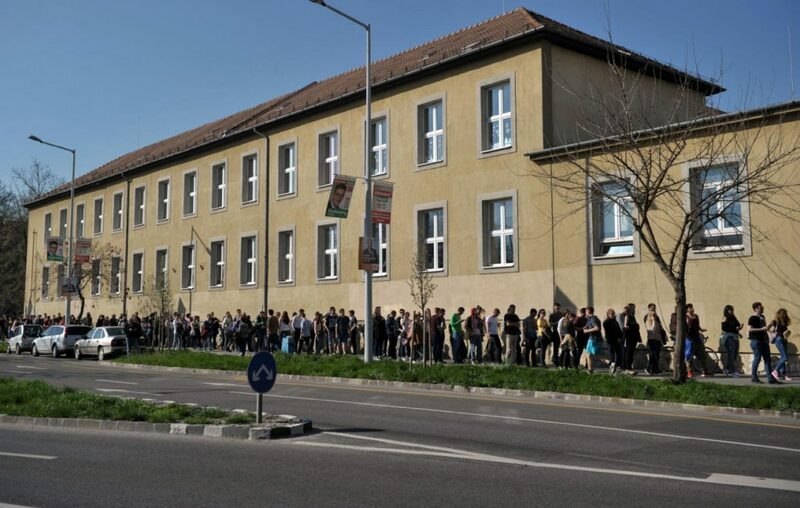 Many of those standing in line are young university students who registered to vote in this riding, even though they are permanent residents in small town or rural Hungary. These students are studying in Budapest and most observers believe they are in large part opposition voters. Ilona Pálffy of the National Election Office confirmed that 2,500 are still in line to vote at this station. She also recognized that the delay and seemingly endless line is a problem that her Office must resolve for future elections. No preliminary results can be released until this station has closed. Index recognized that there are many variables that greatly complicate seat projections–including the large number of Hungarians who voted at embassies abroad (on both ballots), as well as a significant number of Hungarians who elected to vote in ridings other than where their permanent residence is located. The National Election Office has not released any preliminary results yet, as not all polling stations have closed. According to statistics released by the National Election Office, turnout in this election stood at 68.13% at 6:30 PM. Technically, polls are to have closed at 7:00 PM, but many are still open due to voters waiting in lengthy queues to cast their ballots. As such, it seems safe to say that the turnout in this election will exceed 70% when all is said and done. Turnout figures in some Budapest districts are very high. For instance–75% in Central Budapest, which the left-centre opposition is hoping to capture from Fidesz. Turnout in Budapest’s 2nd District, however, is even higher–78%. We should also note that some areas of eastern Hungary where Jobbik has high expectations, especially in Heves county, are seeing massive turnout as well. For instance, in the town of Eger, turnout is 69.3%, while it is 69.48% in Gyöngyös–this is where Gábor Vona is running. 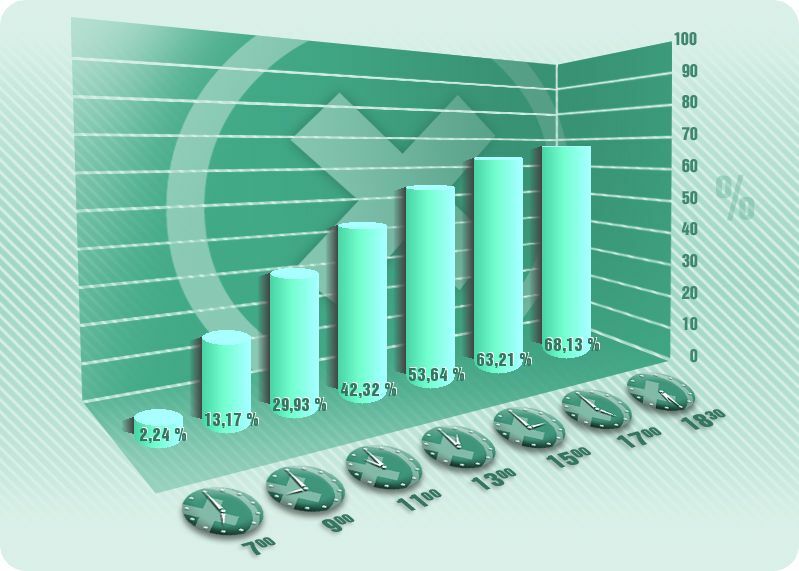 Turnout figures at various points during the day. Source: National Election Office. (12:25 PM EDT): This is the scene outside a Budapest 11th District polling station this afternoon…In many places, queues wrap around the building and voters find themselves standing in line for upwards of three hours. The National Election Office reports that voter turnout at 5:00 PM Budapest time stood at 63.21 percent nationally. Several Budapest electoral districts lead the way. For instance, in the hotly contested Central Budapest, turnout stands at 68.33%. In Óbuda, turnout is now at 70.42%, while in the traditional Fidesz stronghold of Hegyvidék in Buda, it is at 71%. In contrast, turnout in Józsefváros-Ferencváros is relatively low (57.46%). However, turnout levels in the Socialist heartland of Budapest 13th District is 66.38%, thus higher than the national average. Overall in Budapest, turnout is 67.28 percent–well above the national average. Time to put all of this into historical perspective. Today’s 63.21 percent turnout nationally at 5 PM compares to 54.42 percent in the 2014 elections at the same time of day. In 2010, turnout at this time was 59.28% and in 2006 it was 61.72 percent. In 2002, turnout was the highest (higher than today’s) at 65.56% nationally. National turnout levels at different points during the day. Source: National Election Office. Some voters have to stand in line for up to 3 hours to cast their votes in Budapest, due to the unprecedented turnout. The wait time in the 11th District’s Bocskai István School voting station is currently estimated to be three hours long, according to a report by Index. The wait-time in the Budapest suburb of Zugló, where the Socialist-Párbeszéd Gergely Karácsony is the district mayor, ranges from forty to sixty minutes. Election officials promise that anyone who is in line before the 7:00 PM closing time will be permitted to vote. As such, voting stations may close much later than expected today. 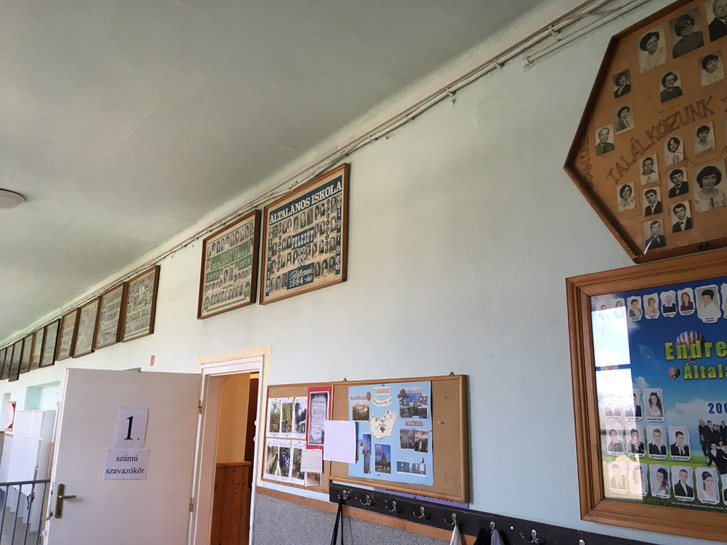 The photographs of both Viktor Orbán and Lőrinc Mészáros, the latter widely seen as the prime minister’s billionaire stooge, disappeared from the walls of the school in the town of Felcsút. This is the school that both men attended in their youth. A reader alerted the Index news site to the fact that the class photographs depicting the two Fidesz politicians have been taken down from the hallway. One might be tempted to develop conspiracy theories, but in fact what may be going on here is an effort by elections officials to avoid any perception of political impropriety or bias–considering that the school building is being used as a voting station. The Felcsút school takes down class photos that include the prime minister and his suspected billionaire stooge. Photo: Anonymous Index reader. We’ve been reporting that turnout in today’s national election is at a historical high. How did turnout look like in prior elections, at the same time (ie: 3:00 PM Budapest time)? In contrast turnout is lower in some inner city districts on the Pest side, especially in Józsefváros-Ferencváros (48.94%). Overall, however, turnout in Budapest is much higher than the national average–standing at 57.71% across the capital. Turnout in today’s critical vote is higher than in any election in Hungary since 1990. According to numbers released by the National Election Office at 1:00 PM Budapest time, 42.32 percent of Hungarians have already cast their ballots. Turnout was highest in Budapest and in the surrounding Pest county. In Budapest, 45.52 percent have already voted and in Pest county turnout stood at 45%. 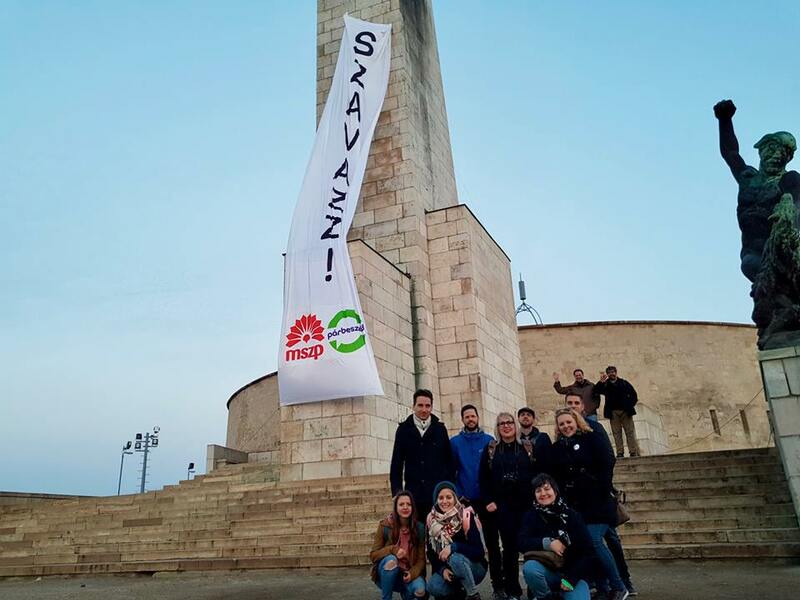 The opposition started off at dawn with a gutsy move: activists from the Hungarian Socialist Party – Párbeszéd alliance (MSZP-P) affixed a large sign onto the Liberty Statue overlooking Budapest that simply read “vote!” Meanwhile, a group of civil society activists are engaging in sidewalk art, urging residents of the capital city to vote. 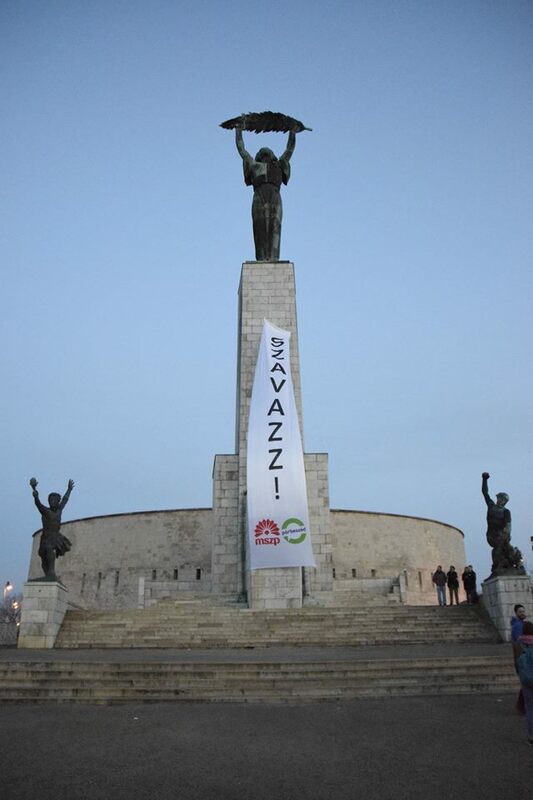 Socialist – Párbeszéd alliance affixes a sign to the Liberty Statue overlooking Budapest at the break of dawn. 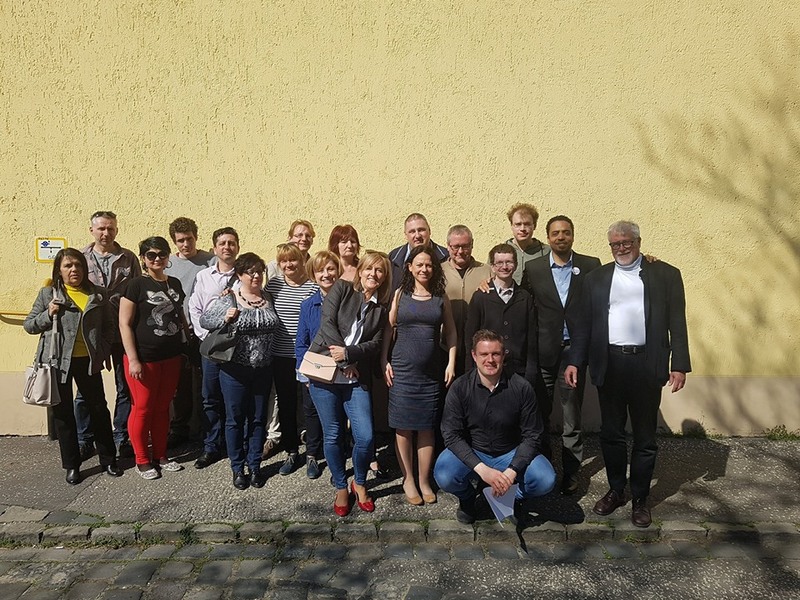 Socialist – Párbeszéd activists urge residents to vote on 8 April. Latest news from Bpest over 57% have already voted, a record! Also spoken to folk waiting patiently in very long lines at the London Embassy. Hungary is one of the last European outposts. I hope Europe and rest of the world will follow Orban! So far in all the European elections every country turned toward the political “right”. Do some here keeps their fingers crossed that Hungary alone will turn “left” ? Pingback: Kanadai Magyar Hírlap – Eredményváró a KMH-ban — Kanadai magyarként miért foglalkozom a magyar politikával? The fact that you would use the term “migrant fear campaign “ says all we need to know about your coverage. Long live Fidesz. Long live Orban. Long live a socialist free Hungary. The anti-immigrant “Fear” campaign? No you arent biased in your reporting at all! It’s awesome! Good for you Hungary! Hang on to your culture and Heritage! You are a beacon of hope for all of us other countries that are shamed into silence, (capped into policy that is forced on us! ), against liberal governments, activist movements, and the Soros initiative! Congratulations!!! When I look at Orban, I am reminded of the “direct from central casting” identikit Soviet Politburo thug from the 1960s: a dull, rather featureless, inert presence who by his very existence, prevents a talented person doing the job to far greater beneficial effect. “We must be humble after this victory”???!!! His revenge of all who have stood up to him will be cruelly swift and I suspect emigration of the best will continue to rocket. But he won 48% so that is what almost half the Hungarian population want, so that’s that. Coupled with the Jobbik vote then it can be clearly seen that the Political Left is now dead, finito. Best acknowledge it. It is always good with a change of power to avoid corruption. I guess though that most Hungarians think like I do, with a quite aggressive EU trying to force its policy down member states throats.. now is not the time. Sweden had a huge change in immigration policy 2015 between the election of 2014 and 2018. Congratulations Orbán Viktor, Fidesz and KDNP, a resounding victory. God Bless you all, and all Hungarians. We can now live in peace for a further four years. One thing that I find striking is the huge difference between general Hungarian preferences, and the preference of those who inhabit this site or KMH. The survey you ran on KMH had DK as the clear favorite, with Socialists in second. In Hungary, DK came away with 5% of the vote. Looking to the next election in four years, I think the Hungarian left really has to get out of its self-made echo chamber (like this one) and face some harsh realities. 1) The left owes Hungary a decade of lost economic development that was lost due to the governing fiasco of 2002-2010. It took a long time for Hungary to get back on track after that. Left’s current strategy is to try to pin many of the after-effects of that on Fidesz (young people leaving, health care sub-par), which is clearly not working. Hungarians are not eager to be taken for idiots. They know who drove Hungary to near economic collapse, and they understand that it had consequences far beyond 2010. 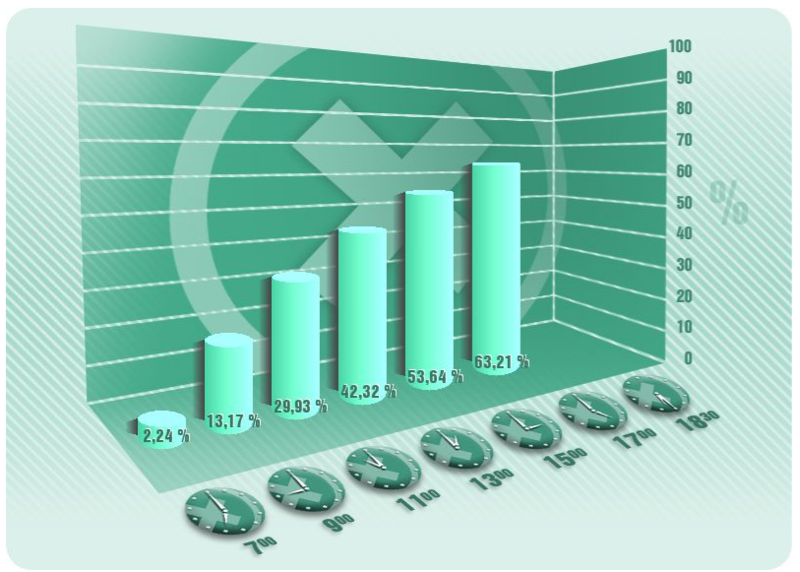 2) Stop denying the current economic recovery. Hungary’s growth is currently among the strongest in EU, in terms of GDP & wages. And it is all happening without a debt bubble. In other words it will not be wiped out when the bubble bursts, like it did last time, because there is no bubble to be burst. 3) Stop siding with Western liberals, globalist-conservatives and others against Hungary. Learn to be in opposition while not opposing Hungary’s interests. And stop attacking fellow ethnic Hungarians, while embracing ME-African colonization through EU forced quotas. It just isn’t a winning message! The Hungarian left did not have a winning message. It just wanted to pretend that Hungary is on the wrong path economically, which is false, while promising to reverse course, which to most Hungarians means a return to the ruinous policies that hurt Hungary & their livelihood in the first place. Listen to Hungarians on the migrant issue and so on. They need to acknowledge the good aspects of Orban’s policies, while promising to do better, by building on current trends. Or they could just get back into the echo chamber and chant “mafia state, Viktator, mafia state, Viktator”. It clearly worked very well in the past 8 years! Fidesz ran a horrible campaign and still got half the votes (with high turnout). Says a lot about the opposition’s message! Hitler also came to power via the ballot box. Popularity contests are not the best measure of wisdom and especially not in places where the manufacture of reality and truth is in the hands of criminals, hell bent on destroying the road to justice, the rule of law and sustainable economic development. The cyber trolls who are given widespread opportunities to congregate here and pour venom on those who are concerned about the consequences of rejecting the values of constitutional democracy, can celebrate as much as they like. They will not be be first but the last to cry. Let them rejoice in that bit of good news. You seem upset with peoples views and I guess in your eyes I am a troll in your view, sounds that way at least. I am a father of 2 girls and 1 boy and one of the things we do is to encourage our children to go to music festivals like Sziget instead of the ones in Sweden (that are not yet closed down). I do not know if you are a father, but in Sweden there is not a festival existing without attacks, things like that change your views. This is a controversial subject and I love different cultures, also in my country. I encourage Hungary to have many different cultures in their country (but would never interfer) and in fact we contribute to that in Hungary on and off. I do not encourage Hungary to copy the Swedish recent immigration model encouraged by Ms Merkel. To me it is a fact it will make Hungary worse off. To the Hungarian centre left, I would encourage you to open your eyes and see facts and not blindfold yourself, you also need to accept other peoples views without calling them trolls or other insults. If you do that people will dare to trust you and you will win elections and change at the top regularly is great for a country. The problem is that people fear what you will do to Hungary.